The odous that remain after cooking are often unpleasant even if we turn the filters above the cooker on, the odours remain. Recently the ionization is being used for this purpose, because the negative ions remove all the dirt particles, such as odours, cigarette smoke, bacteria, viruses, dust, mite faeces, etc. from the air. The odour is a sub-micron particle of food, which floats after cooking under the ceiling and is slowly dropping to the floor. 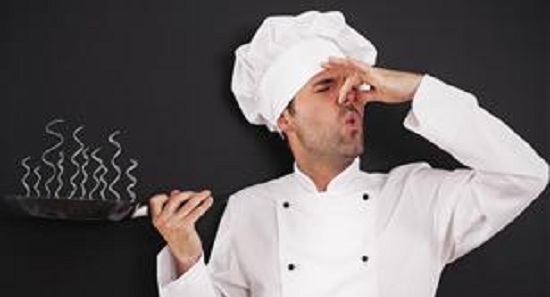 This is why the smell of food can be detected long after cooking. In this case an ionizer can help. The IONEX 220 ionizer is suitable for every room, since it is very small (12 cm in diameter and 9 cm in height) and can be placed anywhere. Despite its small size the ionizer emits such a huge amount of negative ions that some of the ions are not used for cleaning the air, but to enable a favorable influence on the human body. The IONEX 220 ionizer operates silently and consumes very little electricity. 14 KW / year x cost assumptions energy equal to euro 0.25 = euro 3.5 years. It’s best to place the ionizer at a high point of the room, so the negative ions can reach the odours faster, attach to them and make them fall to the floor and/or other surfaces. No floating particles can be seen in a solar beam that shines in our living spaces. In addition to the kitchen and living room, you can ionize other spaces, especially is recommended ionizing the bedroom , because the negative ions enable sounder and peaceful sleep due to the fact, that level of serotonine H5, the stress hormone, is lowered. They also prevent us from acummulation in the lungs and from infectious diseases, they balance the blood pressure and heartbeat, they have a good influence on the thyroid gland, vitality and concentration. In ionized spaces you feel much better, so you should improve the quality of living by using an IONEX ionizer.